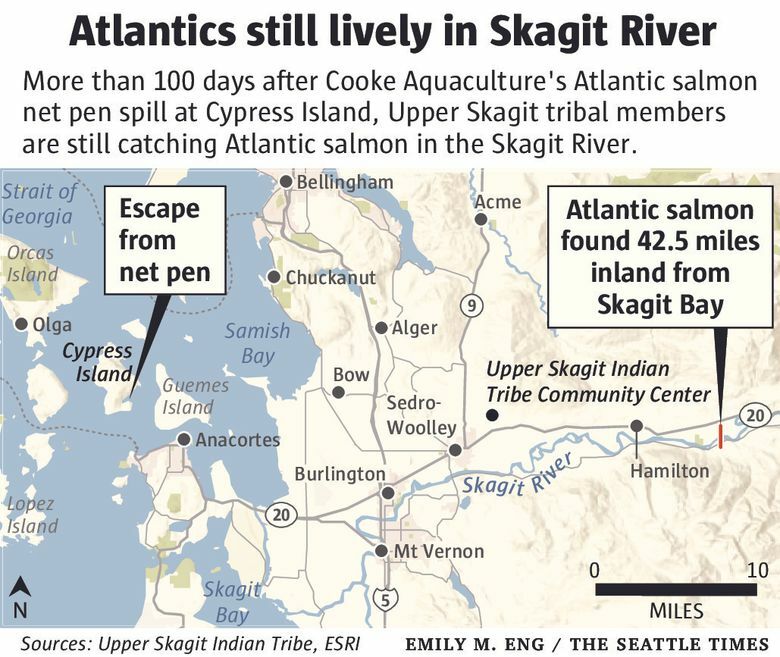 More than three months after about 100,000 Atlantic salmon escaped a net pen in Puget Sound, they are still turning up strong and lively in the Skagit River. Strong, silvery and feisty, the Atlantic salmon hit the boat deck, thrashing and thumping. It was the sixth one the Upper Skagit Indian fishing crew caught that day. 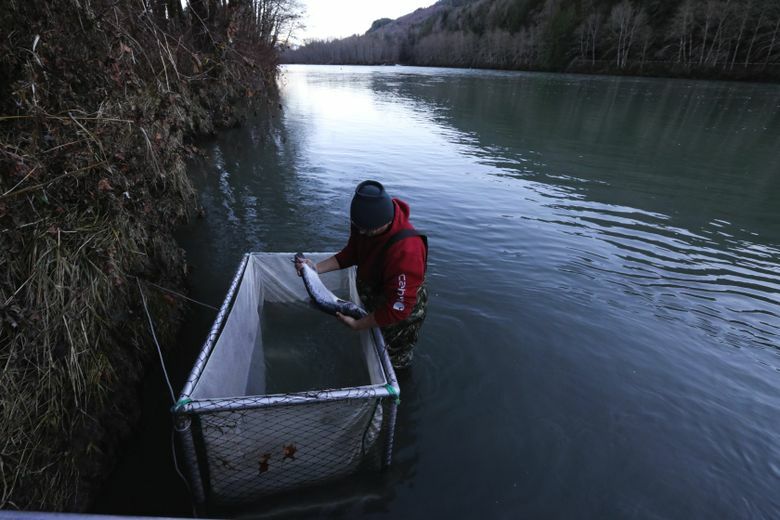 More than three months after a massive escape of Atlantic salmon from Cooke Aquaculture’s net pen at Cypress Island, Atlantics are still turning up very much alive in the Skagit River, one of Washington’s premier Pacific salmon strongholds. 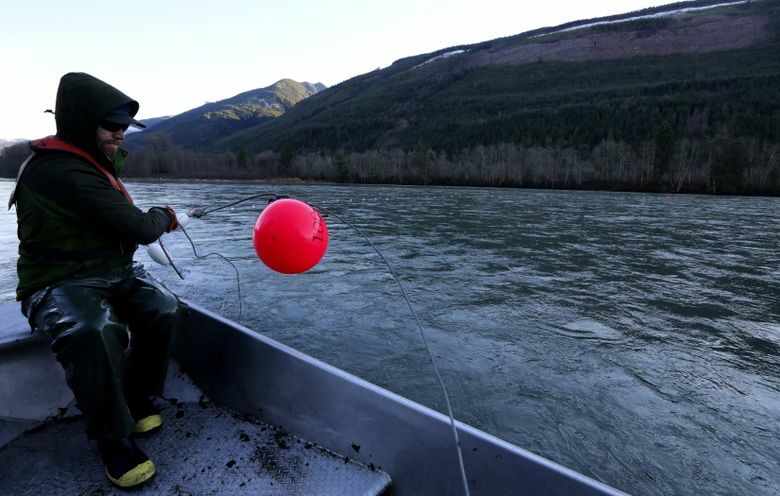 Out to collect chum for broodstock for the tribe’s hatchery, the crew drifted a quarter-mile stretch of the river, putting in at Hamilton, Skagit County. They caught more Atlantics than anything else: more than coho, more than chum, more than Dolly Varden trout, more even than suckers. Caught more than 42 miles up the Skagit in a brief fishery in just a short stretch of river, those Atlantics were surely not the only ones in the river or the region, said Scott Schuyler, natural-resources director for the Upper Skagit Indian Tribe, based in Sedro-Woolley. More than 100,000 Atlantics were never found after the escape from Cooke’s net-pen farm the weekend of Aug. 19. The farm contained 305,000 Atlantics from 8 to 10 pounds at the time. 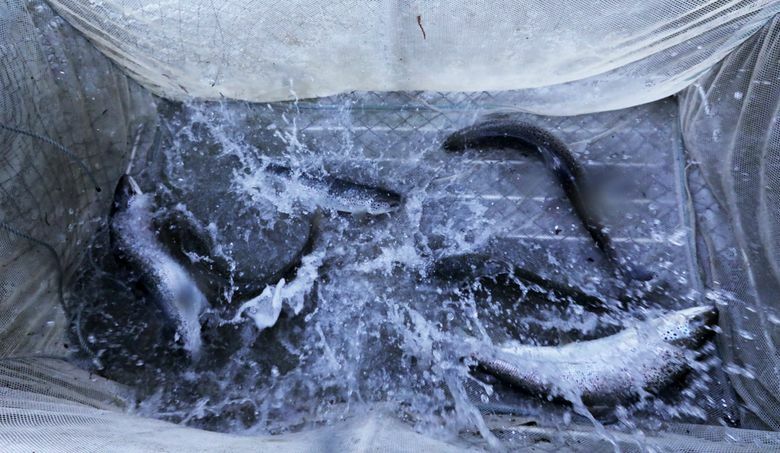 The lively Atlantics caught last week dented the oft-repeated assurance from state agencies and Cooke Aquaculture in news releases and hearings that the escaped Atlantics are all gone, dying out, wasting away. Over three days last week, the tribe caught 12 Atlantics and seven native chum, Schuyler said. 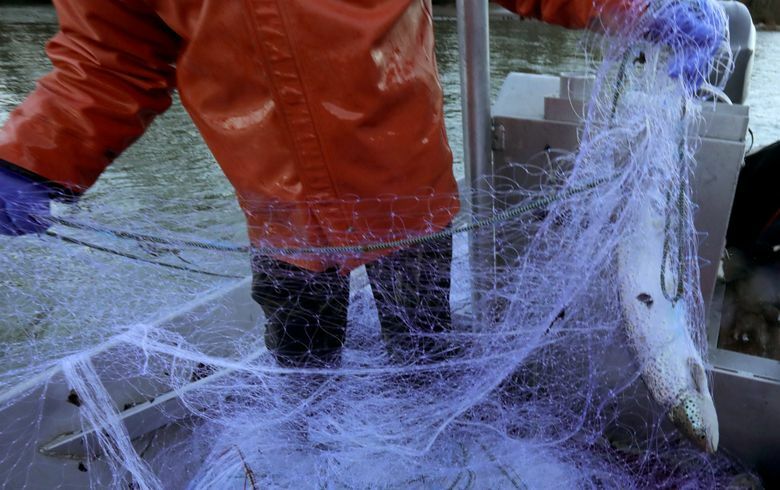 Every time the tribe’s fishermen go out for chum, they catch Atlantics in the Skagit, home to all five species of Pacific salmon, and the biggest chinook producer in the Puget Sound region. 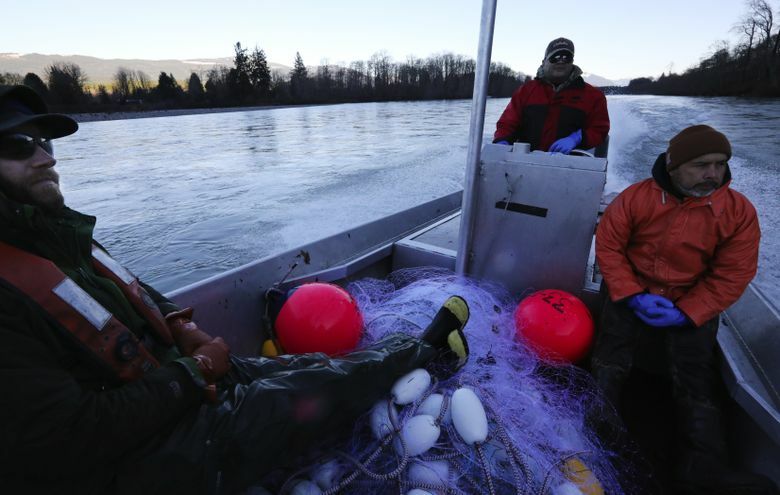 An eagle led the way upriver, its wings beating a stately cadence as Schuyler and two fishermen for the Upper Skagit Indian Tribe motored their skiff to set a net in the water last Thursday. The glaciered North Cascades gleamed to the north, and the reflection of a clear, bright-blue sky colored the boiling, slate-green waters of the Skagit. “Oh, look, one of the nonexistent Atlantics,” Schuyler cracked, as the crew brought the net up and over the side with a silvery, spotted Atlantic. “Our ancestors never had to worry about this,” he said, with a shake of his head. Nell Halse of Cooke Aquaculture said the company is looking into the continuing catches. “I can confirm that we are working with the Upper Skagit Tribe to gain a better understanding of the fish that appear to be Atlantics and their origin,” she wrote in an email to The Seattle Times. Atlantics are readily distinguished by experienced fishermen from native Pacific salmon; they are a different species of fish, with a different body shape, as well as different markings. Mark Baltzell, Puget Sound salmon manager for the Washington Department of Fish and Wildlife (WDFW), said he had no doubt the fish caught by the tribe — which he has seen in photographs — were Atlantics from the escape. “They look like Atlantics to me. We haven’t had any other escapes, so I wouldn’t have any reason to doubt it,” Baltzell said. The tribe is sending the ear bones of the fish to the WDFW to verify the unique mark Cooke is required to make on its fish by manipulating the water temperature while incubating the Atlantic salmon eggs it imports from Iceland, hatched in its land-based hatchery in Rochester, Thurston County. 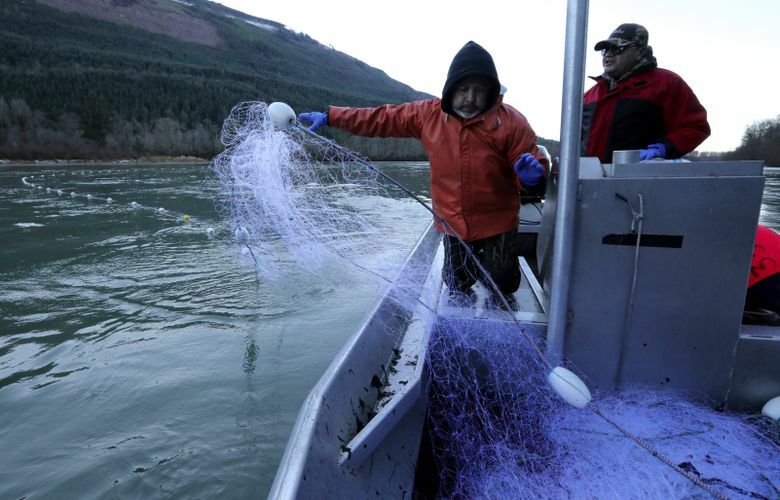 Fish experts at the WDFW have said since the first day of the collapse of Cooke’s net pen that the Atlantics don’t pose a risk to native salmon. Even when the department was trying to establish an Atlantic salmon fishery in Washington in the past, it failed. “The fact there have been many attempts over decades to establish a population and they haven’t taken hold suggests there is not a risk for Pacific salmon,” said Kirt Hughes, regional fish program manager for the agency. The fish tested also are not sexually mature, Hughes said, and have been free of disease. 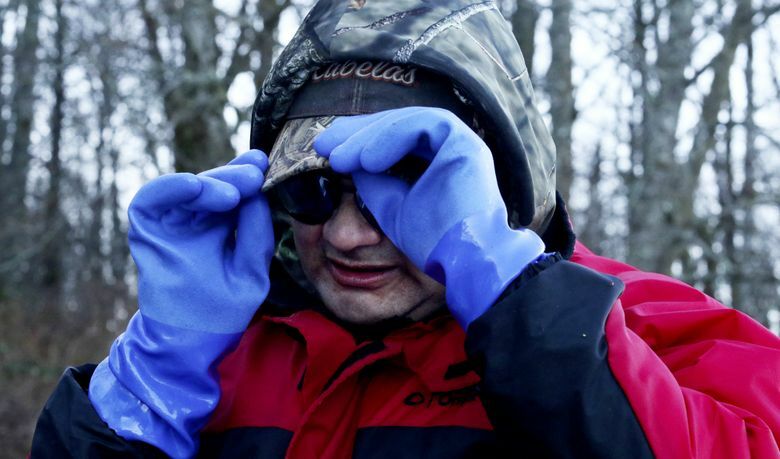 In all, the department has tested 38 salmon so far from the release, not counting the ones recently caught by the tribe, Baltzell said — a small number of the more than 105,000 Atlantics from the escape still unaccounted for. 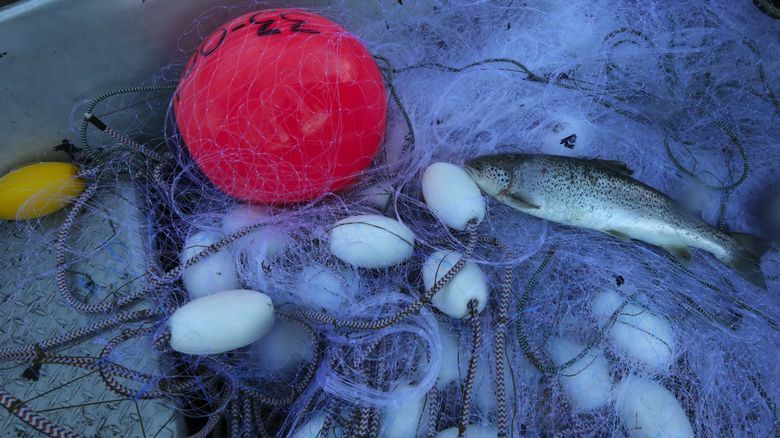 Since the escape, two bills have been proposed for the coming legislative session to end Atlantic salmon net-pen farming in Washington. A GOP initiative has already been pre-filed by Rep. Jim Walsh, R-Aberdeen, and Rep. Drew MacEwen, R-Union. It is emergency legislation to end Atlantic salmon net-pen farming upon signature of the governor, breaking existing leases held by Cooke at the farms. Another bill, proposed by Sen. Kevin Ranker, D-Orcas Island, would let the leases at Cooke’s eight farms run their course, with the last lease terminating in 2025. Ranker said he intends to introduce the bill Tuesday. Cooke’s farms provide about 80 jobs in Washington and paid $238,139 in royalty and lease fees to the state in 2016. The Department of Natural Resources holds the leases for the farms.